The box office is open Monday-Saturday from 12noon - 6pm. We will also be open promptly for any new public on sales - for example, if a show goes on sale at 10am Saturday, we will be open at 10am to help you out. We open at 3pm on Sundays when there is a Fillmore show, and at 5pm on Sundays when there is a Foundry show. On show days, we stay open longer - we usually close down shortly after the headliner takes the stage. How do I find out about Premium Seating opportunities at the Fillmore Philly? For unrivaled hospitality and the ultimate experience at our events, please call Premium Seat Sales at (610) 784-5425 or email FillmorePhillyPremiumSeating@LiveNation.com. 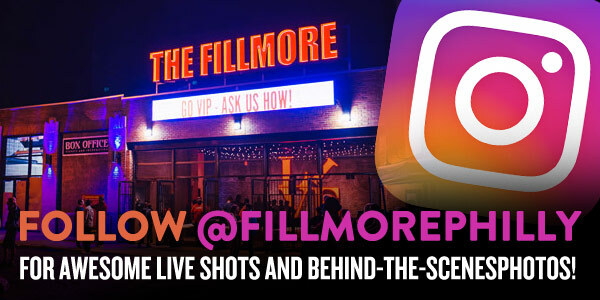 How can I rent The Fillmore for a private event? We have multiple spaces and can cater to groups of 25-3,000 for special events. Our event specialists are ready to talk to you and help take your event to the next level. Please contact fillmoreevents@livenation.com for more information. How can I get my local band booked at the Foundry? Philly has an amazing local and regional live music scene and we want to see as many bands as possible grace our stage! For information on local booking please contact foundrybookings@livenation.com. How do I buy tickets to upcoming concerts? Once tickets go on sale for any given show there are many ways to purchase tickets for concerts at The Fillmore and The Foundry. You can visit our website, ticketmaster.com or livenation.com as well as purchase tickets in person at the TLA, Tower Theater and The Fillmore box offices. Please note that the Tower Theater box office does not operate daily like most of our box offices. The Tower Theater box office only operates on days during which a) a Tower Theater performance is going on sale to the public and/or b) there is a performance at Tower Theater. Please note that there are no services fees charged at any of our box offices if you are purchasing tickets on the day tickets are going on sale to the public. Children of any age may NOT attend a "18 " or "21 " concert or performance. What kind of food will you serve? Fear not - whether you prefer Uber (like us), SEPTA or driving yourself - we have you covered. Please click here for all transportation information. The Fillmore Philadelphia offers ADA seating and additional accommodations (as needed) for those with disabilities. To inquire in advance, please contact the box office directly for further details. To inquire on-site/upon arrival, please arrive as early as possible to speak to a Guest Services or Box Office representative for further assistance.